Approx 27cm length, 7cm base & 4.5cm shaft. 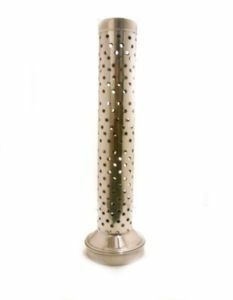 This incense holder is ideal for keeping your furniture safe from any unwanted burn marks or messy falling ash allowing you to safely enjoy your favourite incense in peace and comfort. For safety ensure the stand is kept out of reach and on a flat safe place when in use and where it cannot be knocked over easily.